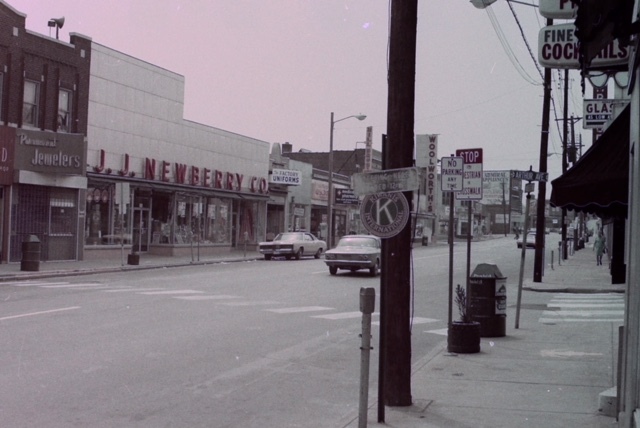 Glenn Haley took these pictures prior to Kmart being built on Manchester Road in Maplewood. He shared them on Facebook recently. I love seeing those photos. 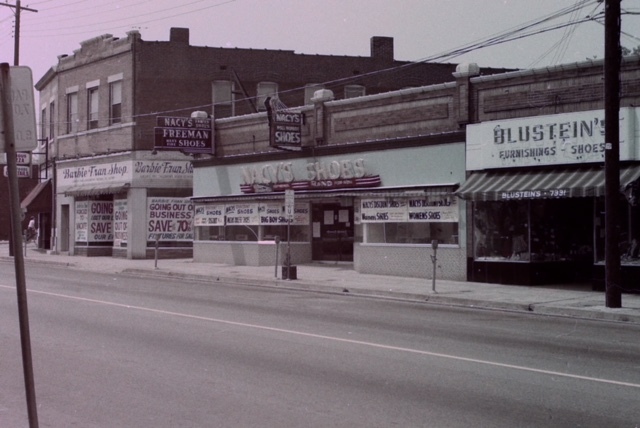 My grandparents lived on Sutton and I used to love to visit them and go down the street to all those dime stores. 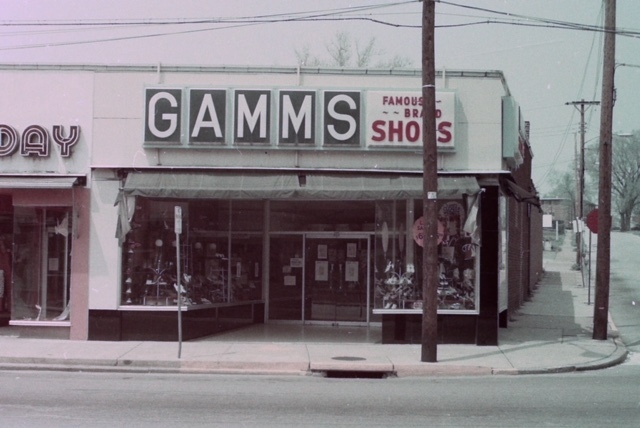 We lived in Brentwood and didn’t have those stores. My mother and aunt sold the house and a 2 family flat to Kmart to build there. I grew up in Maplewood 1936-1960. It was such a great place for a kid to grow up. 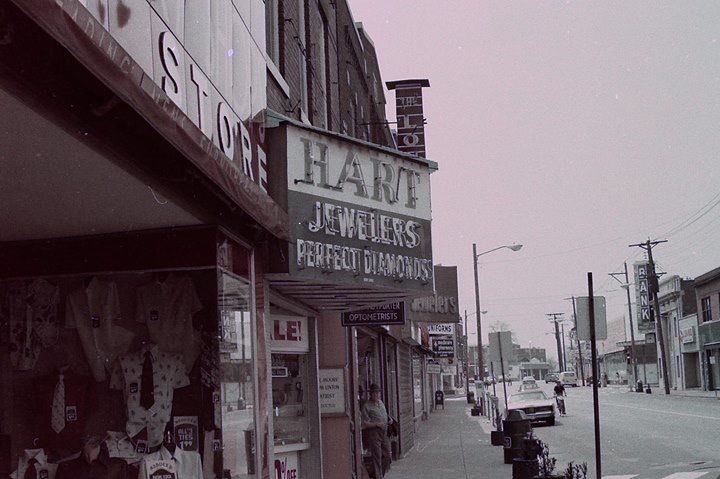 In Valley Grade School I worked after school and on Saturday’s at Godfrey’s on Manchester – a little store that had hamburgers, candy and ice cream. Mr. Godfrey and his brother lived above the store. 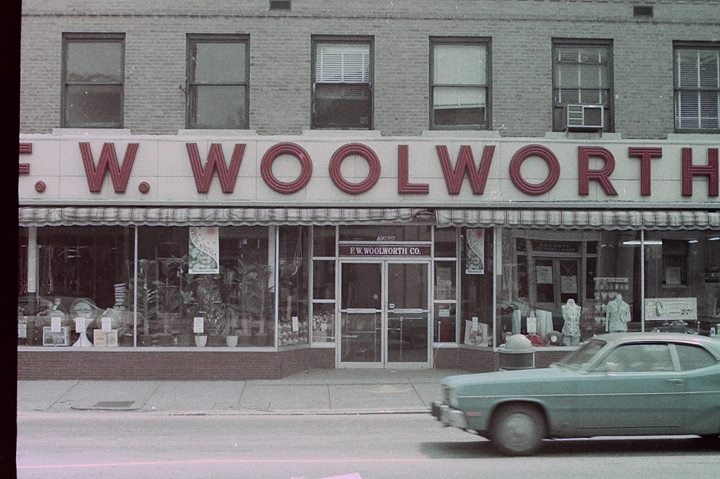 When in High School I worked first at Woolworths in the Stock Room, later at Goldie’s Department Store and finally at Citizens National Bank. 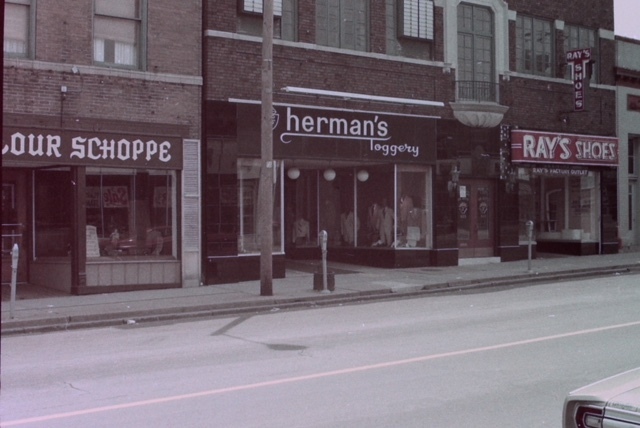 I wish I could remember the name of the store close to Goldie’s where they made their own skirts. All the same style with a kick pleat in back, but every color and fabric that you could think of. Thanks so much for the pictures – they sure bring back memories. I moved here and had no knowledge of the past and the KMart garage. I actually thought it was kind of a neat place for my kids and I and some of the neighbor kids. On Sunday afternoons if the weather was bad we would head over there for a game of wiffle ball. My kids did a lot of bike riding down there on Sunday afternoons. We would take a box of boxes and make an course to learn to ride thru and around. Once or twice I remember the police showing up and saying someone had called and said it sounded like someone was being murdered down there. Lots of yelling and fun that echoed thru that garage and it was just me and my kids. In the picture the bank has already changed names to Pioneer Bank. They did move to folk and Big Bend and or later bought out by national city Bank which was then purchased by PNC bank. The old bank building was a marble marvel. Are used to go there with my father in the 60s. Does anyone know where that building in the third picture was (is)? Im guessing it was a restaurant or bar, the lamp above the door appears to have the Falstaff logo on it. That was the dining area behind Eddies Tavern on Manchester. I simply can’t place Eddie’s, which is terrible – I knew the family! What corner was that? The Bank of Maplewood building looks like it was such a beautiful building. Too bad it was a competitor to the bank on the other corner. Maplewood Bank moved to Folk and Big Bend. I believe it was later sold and the name was changed. 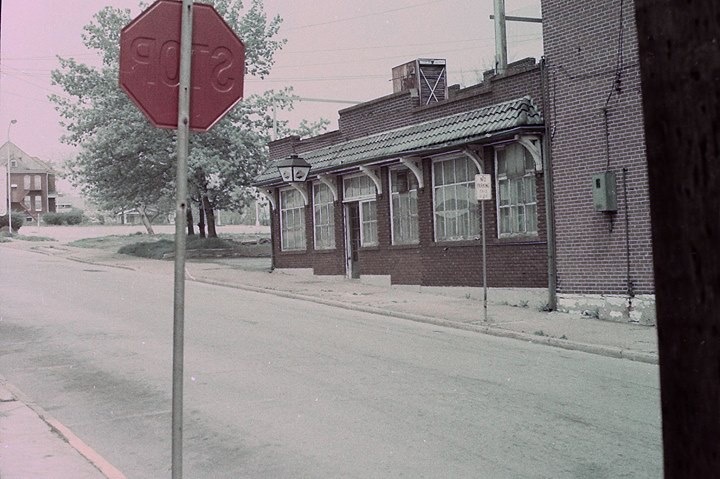 It became Pioneer Bank in the 70’s, maybe late 60’s not sure. 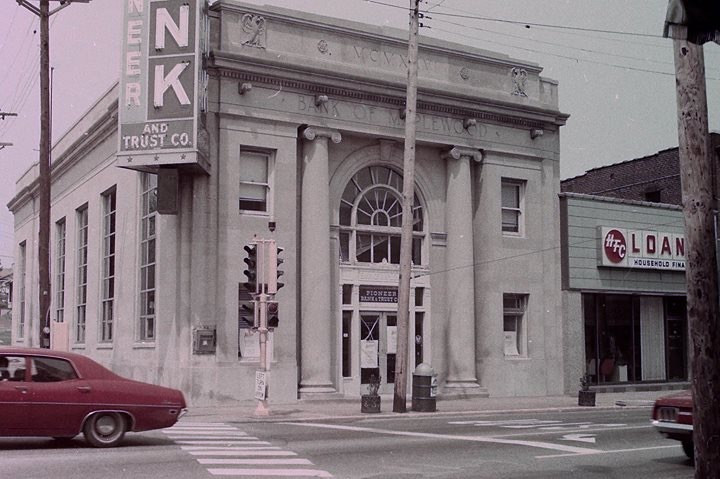 The Maplewood Bank was Pioneer Bank by the 50s. (Can anyone read the date?) The president of the bank walked around and greeted customers all the time, including my parents. 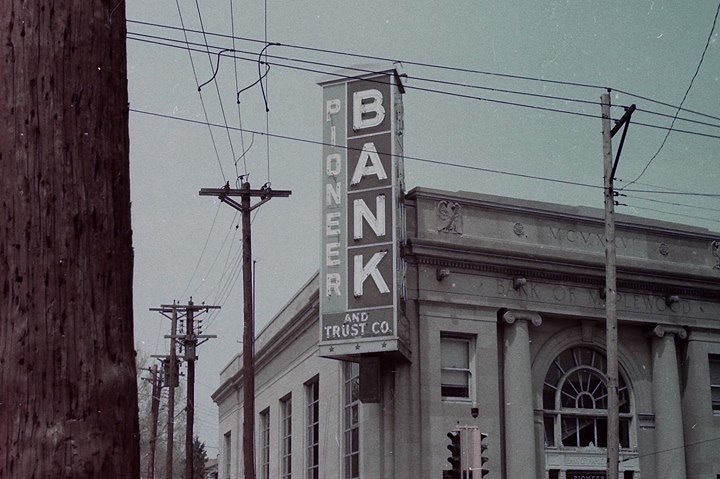 Family owned, Pioneer was considered the Republican Bank. (I thought the pillars made it look like the Mary Poppins bank) Later, I taught with the son of the owner. They lived on Goff in Richmond Heights. Citizens National Bank—which I understood belonged to the Dolan Family known for real estate at the time—was considered the Democrat bank. My parents conversation, reasoning and rationale for patronage at least. 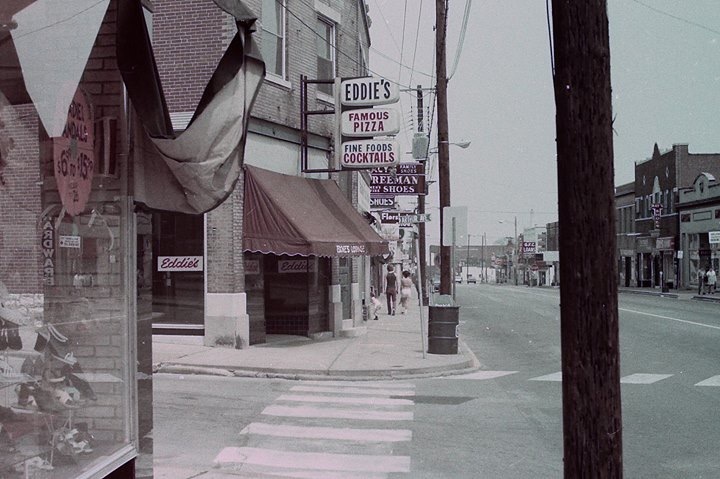 We got great donations at Eddies corner bar when caroling with the Methodist church choir on Christmas Eve (1960s). It was our total Downtown in the 50s, early 60s. With Bettendorf and National south along Sutton. Mechanics and filling stations within about a 6 square Block area. You didn’t need to go anywhere else. Our church was on Sutton too! Back there today! Memories!! Thx, Doug! Great shots. Shows what a shame it was to tear down the classic Pioneer Bank & Trust building, and some of the other old stores on the north side, for a ridiculously designed Kmart building with the foreboding parking lot/garage fronting it. Egad, who was the architect for that design? I do. Terrible plan and it was never fully leased. Didn’t like walking through the garage, sounded like it was ready to collapse. Can we just put all of that back there? 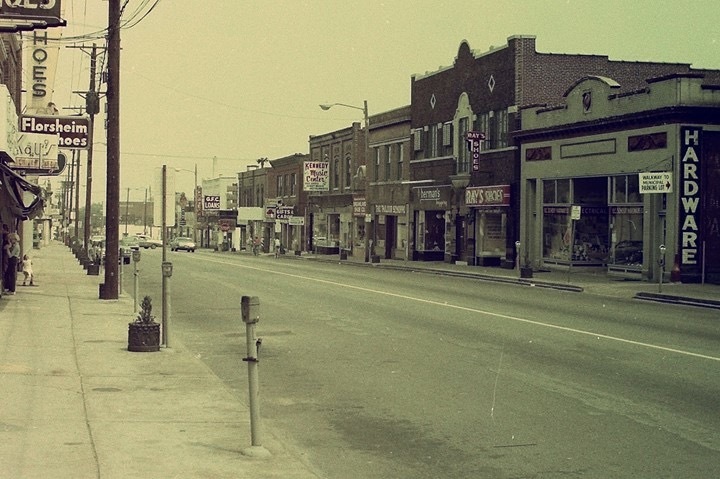 I miss the Maplewood (and America) that I grew up in back in the 40s-50s. Yep, when women were in the kitchen and black people weren’t allowed to vote, right? That was uncalled for. Really. But I see his point. Maybe good for some people but not for others. There are good things I wish we could have kept (like historic buildings and kind people who died way too young) while still losing the bad things. My wife remembers segregation in the South in the early 1970s while it was never part of my memory in Nebraska, Kansas, or northern Missouri. lol. getting real with nostalgia. I like it. 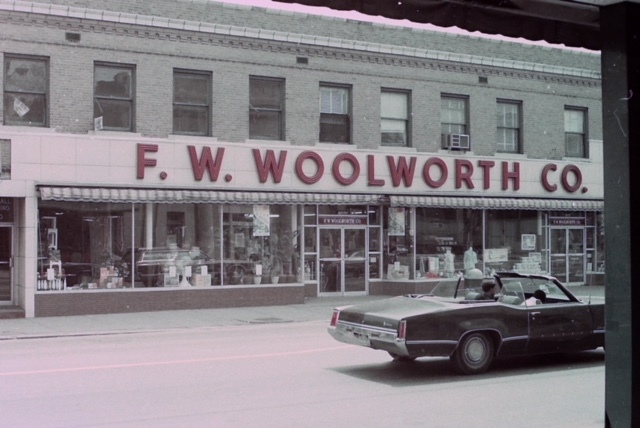 Heck, I miss the way things were in the 70s and 80s and that’s when Maplewood was a real dump. The old Kmart parking was fun to run around in, though. Always smelled like a combination of popcorn and plastic. 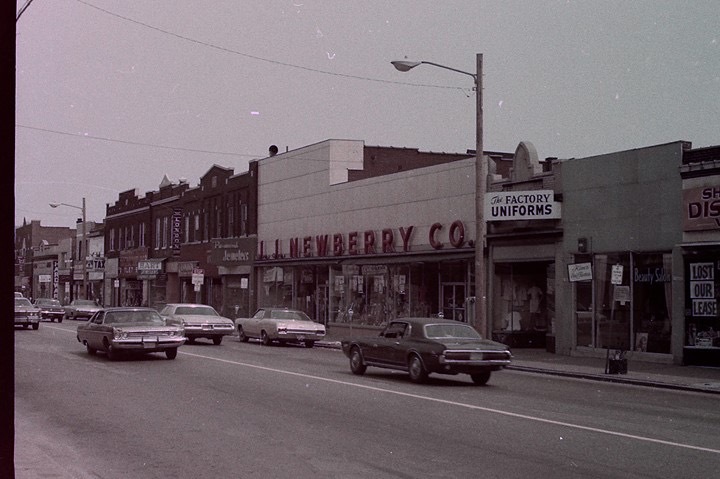 The buildings on the North side of Manchester and the neighborhoods behind them were demolished in the mid-70s. 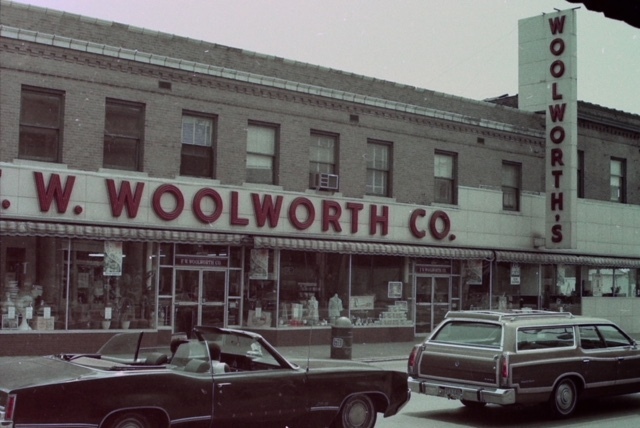 The K-Mart store opened in 1976. I don’t believe the new store fronts at street level were ever 100% occupied in the 30+ years that horrible structure existed. Anyone remember? 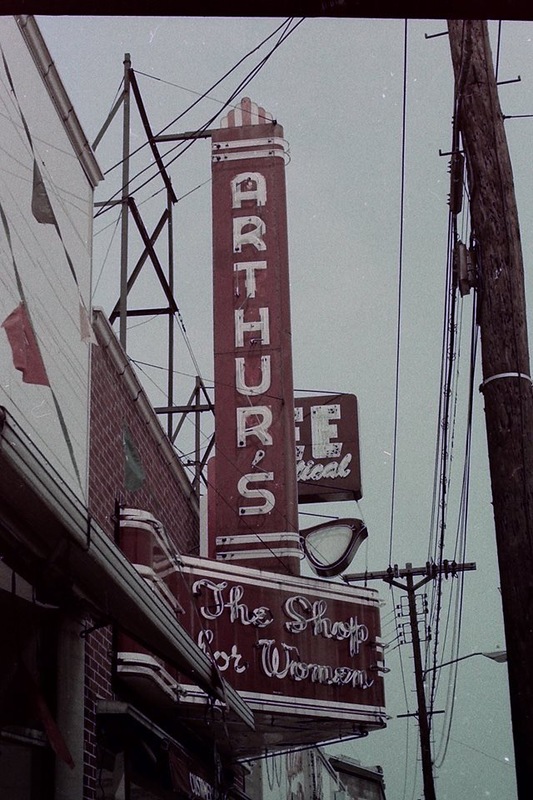 Great pics, I used to live on Arthur by Eddies Pub. Brings back memories. I forgot that street name but it was also the carnival behind the stores correct?